The setting sun provided the golden touch to this scene adding colour to the texture created by the masts of the sailboats. Just smashing views of much activity at the Oakville Harbour. This is the view I see everyday while crossing the bridge on Lakeshore Rd at Navy Street. In the distance you can see the sailboats from the sailing school. 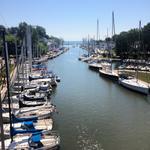 Sailboats line Sixteen Mile Creek at the mouth of Oakville Harbour. Taken from the Lakeshore West bridge (Navy St x Lakeshore West). 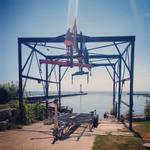 Boat lift at Oakville Harbour with pier in the background. You will find this artwork between the Oakville Power Boat Club and the Canoe Club on Water Street in Oakville. Oakville also has some new and tasteful townhouses among the historic homes in South Oakville. GLEN G TUGBOAT FOR SALE 65' long powered by GM diesel, working washroom, shower, vanity, almost complete. Curretny mored below Oakville bridge in Oakville harbour. Priced to sell, $39,000. will consider trades.